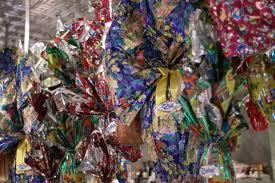 Chocolate Easter eggs are clogging the supermarket aisles in Italy these days. And the pastry shops and chocolate confectioners are overflowing with handmade treasures. These chocolate eggs are an old tradition here. Each hollow egg contains a surprise, and finding the surprise is half the fun. The smallest eggs are about 10 inches high, made from about 500 grams of chocolate. 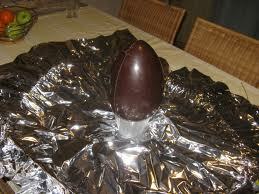 The eggs can be as large as five kilos, which is a hefty amount of chocolate indeed. Each egg is balanced on a little plastic cup to make it stand up straight. Then it’s placed on a square of colorful foil which is gathered up around the egg and fastened in a topknot, often with a ribbon. The supermarket variety targets children. The foil wrapper hints to the prize inside, and children have their favorites. A quick stroll through my neighborhood supermarket revealed eggs featuring many cartoon character—T om and Jerry to Scooby Doo to the Roadrunner (known here as Willy Coyote and Beep Beep). Disney is well represented, too, with 1001 Dalmatians, Snow White and Peter Pan. Some eggs contain prizes that are targeted for girls, others for boys. The eggs for girls are labeled “Bimba” in large letters while those for boys say “Bimbo.” This is diminutive for the word bambino, child, with the characteristic “a” ending for feminine words and “o” for masculine. It always makes me giggle since “bimbo” in American English usually means a ditzy female. I’m longing to call a male American friend Bimbo. But I digress. Commercial eggs targeting adults use other ploys. Perugina, the manufacturer of Baci candies, makes an egg featuring the dark chocolate of their kisses; the prize inside these eggs is four Baci. Lindt, from neighboring Switzerland, gets in the act, too. Their elegant eggs are wrapped in red foil and topped with gold ribbon. And the choices! One company produces a candy bar called Novi made from chocolate embedded with hazelnuts. Their egg is called “Noccciolato,” combining the Italian word nocciola (hazelnut) and cioccolato (chocolate). It’s the only egg I’ve seen that’s bumpy. People stand in the aisles discussing the merits of milk chocolate vs. dark. They’re both available, but you have to read the label carefully. The pastry shops and chocolate confectioners make the eggs by hand with elaborate decorations. The prizes inside these eggs tend to be more elegant, too. These shops are prepared to make eggs to order. You see chocolate egg halves awaiting a customer’s special prize. Engagement rings are frequently tucked into these. The customary way to open a chocolate egg to get at the prize is to punch it with your fist. It seems crass, but that’s the custom. And you do get a little bit of joy at feeling the chocolate give way to your blow. Billie Mochow, a renowned pastry chef in the U.S., asked me to look for egg molds last year, a month or so after Easter. She wanted to create for a confection, not chocolate, for this year. Now, Italy bends with the seasons. At that point, Easter was well behind us. There were no egg molds in cookware shops. I approached a couple of pastry shops to see if they could special order them, but I got a lukewarm reception. The egg season was over. Billie found her own source and has produced an incredible work of art. And just as I expected, egg molds began appearing in upscale cookware shops a few weeks ago, but they’ll be gone soon. We've received those hollow, charm-filled eggs from Italian friends in the past, but I didn't know we were supposed to punch it open. If we get one this year, we'll do that! Hey, do it. It's fun! It's a dangerous season here. People buy many of these eggs as gifts, and they all give them to each other. One of my classes gave me an egg that was about 15 inches high. Oooh. So much chocolate.